I’ve discussed about Google Sets in the past. I am now sad that I found out that Google Sets has been shutdown. But I am happy to find that although the website of Google Sets is gone, its spirit is still linger around. 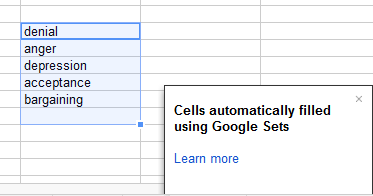 You can found it working inside Google Spreadsheet. You can try this by typing one word in a cell. Then press Control button, and drag the corner of that cell down. I hope it’s useful to you, Cheers!